Gramilano has already written about Cincia Puricelli’s dancing school Proscaenium, which is based in Gallarate, a town near Milan’s Malpensa airport. An ordinary town, and on the surface an ordinary dancing school, yet it is bravely run with ambitious goals. Last year Puricelli’s conceit was to invite Carla Fracci (for her first public masterclass) together with Pompea Santoro to work on the second act adagio from Giselle: Fracci with the classical version, Santoro on the version by her mentor, Mats Ek. It was novel, illuminating, and delightful. Now at the end of the school’s golden anniversary year, there is another event, a Gran Galà, which is in no way an end-of-term show. Some of the top talents from Italy’s dance world have come together to create original choreographic works. How? Indeed, why? Well partly, because over the years Puricelli has built up a faithful network of La Scala dancers who believe in her work and seriousness and, in this occasion especially, because their fees will be waived and the money will be awarded to two students to let them continue their studies at the highest level. The talented young dancers are two 17-year-olds: Duccio Tariello at the Accademia di Danza di Zurigo, and Veruska Composto at the Scuola di Ballo dell’Accademia Teatro alla Scala. says choreographer and former dancer at La Scala, Massimiliano Volpini. 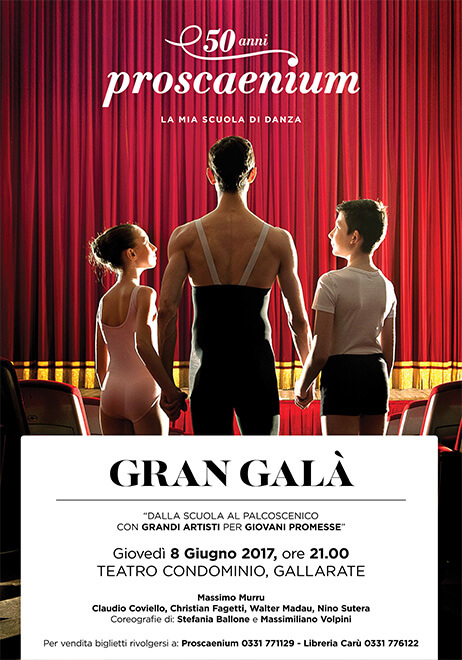 Volpini, who has created some witty and imaginative pieces — including Il mantello di pelle di drago, Prototype for Roberto Bolle and Friends from American Ballet Theatre, and Il Giardino degli amanti for La Scala last year — has worked with the school’s students, and the actor ‘gipeto’, to create a dance piece using Camille Saint-Saëns’ Carnival of the Animals. The second part sees five male dancers from La Scala — Massimo Murru, Gabriele Corrado, Christian Fagetti, Walter Madau and Gioacchino Starace — in a piece created by Volpini together with Stefania Ballone, a talented ballerina at La Scala who recently was co-choreographer for a new work for the La Scala Ballet Company. We made the dance school, and the dance studio, the protagonist of the show… the classes, the rehearsals. There are also some comments from students about their first contact with dance, their first teacher, and so on. All the choreography is new, and we are using music from the classical repertoire to reflect the dance world we come from, but we will use them with great creative freedom. To see… and for a good cause: supporting the dancers of tomorrow.